White spots are areas of discolored enamel most frequently seen on the front teeth. There are numerous causes for white spots. Inadequate home hygiene during orthodontic treatment (braces) is the most common reason. No need for expensive porcelain. We accomplish this by utilizing a new but proven cosmetic dental procedure. We regenerate the subsurface discolored enamel using a product called MI Paste over one or more in-office sessions using a patient-specific protocol. 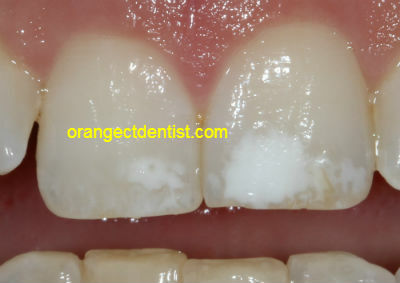 White Spot Treatment on a patient from Milford, CT. 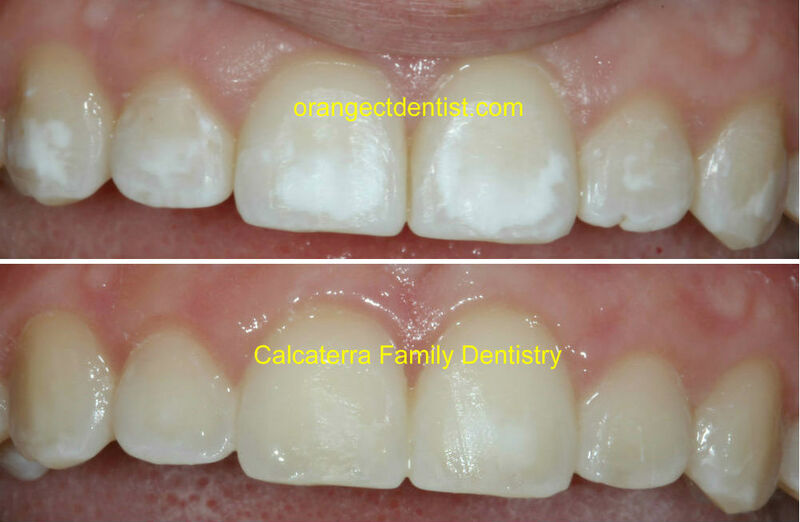 Treatment and photos by Dr. Nicholas Calcaterra. Clicking on the image will yield a larger version. In the above case, this was a 15 year old female from Milford, CT. She had minor white spots present before orthodontics. When the braces came off, she had significant spots from the brackets. Treatment included 4 sessions in our office in Orange, CT as well as at home use of MI paste. The results speak for themselves! 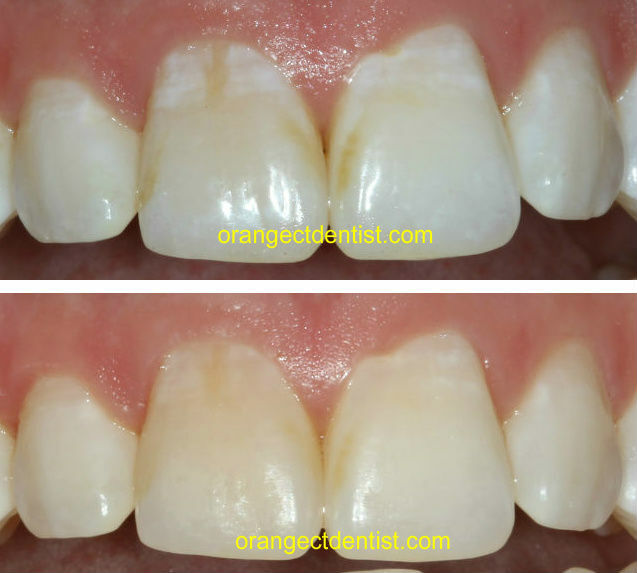 In the above case, you can see the almost complete elimination of the horizontal white bands near the gum area as well as a great reduction in the size and darkness of the brown spots. This was completed with two 30 minute in office sessions along with home use of MI paste. Remember: this was completed with no needles, no drilling, no filling! Poor home care during orthodontic treatment. Elevated levels of systemic fluoride while the teeth are forming, leading to a condition called fluorosis. Infections of the baby tooth which can cause damage to the enamel of the developing adult tooth. One or more fevers during the early childhood years when the adult teeth are developing. Fifty or more very rare genetic disorders. Prior to beginning treatment, Dr. Nicholas or Carla Calcaterra will examine you in our Orange, CT office. We will ask very specific questions about the origin (if known) and history of the white spots. Understanding how the white spots formed is critical to achieve a successful treatment outcome. Once we have an understanding of how the white spots were formed, we will recommend a specific treatment regime involving one or more sessions. Polishing of the affected tooth surfaces (2-3 minutes). Application of a conditioner to “open up” the enamel to allow it to be remineralized (20-60 seconds). Application of the MI Paste where it sits for nearly 10 minutes. Removal of the MI Paste. What is missing from the above? Needles, numbing, drilling, and porcelain! None of those are required! Call us at (203) 799 – 2929 or visit this page to schedule a consultation regarding the non-invasive treatment of your white spots.